The nine individuals are collectively worth $104.7 billion, with the bulk of that worth ($86 billion) coming from four individuals. Only one member of the group — Canadian Guy Laliberte — has been to space, flying to the International Space Station aboard a Russian Soyuz spacecraft in 2009. He is not known to have been involved in any space projects since returning to Earth. Richard Branson and Elon Musk are the billionaires most prominently connected with space travel in the public’s mind. This is interesting because of the disparity in results between their two companies. SpaceX has launched its Falcon rockets 10 times, with the last seven successfully placing payloads into orbit. Earlier this week, one of the company’s Dragon freighters docked with the International Space Station. Thus far, Branson’s connection with space has been as much a matter of hype as actual accomplishments. After more than eight years of development, the brash British billionaire hasn’t gotten SpaceShipTwo above 51,000 feet, and never under its own power. That situation is set to change later this year as the suborbital craft begins powered test flights. After Musk, Microsoft co-founder Paul Allen has been the most successful billionaire space investor. 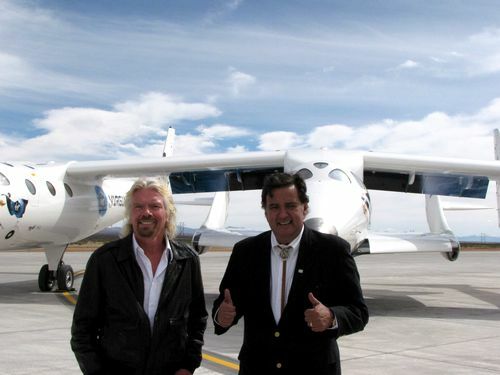 He backed SpaceShipOne, which became the first privately-funded vehicle to reach space in 2004. He subsequently sold the rights to the technology to Branson and donated the the ship to the Smithsonian Institution, managing to turn a profit on his investment. Allen is now backing an even more ambitious effort, Stratolaunch Systems. The company is building a massive carrier aircraft that will air-launch satellites into space. His primary partner in the venture is Scaled Composites, the same company that built SpaceShipOne. Jeff Bezos is the most secretive billionaire space investor on the list. Despite becoming much more open over the past year, we still don’t know all that much about Blue Origin, which is developing crewed suborbital and orbital spacecraft. It would be interesting to know how much the project has cost, and how much Bezos has invested personally. Google Co-founders Larry Page and Sergey Brin and Chairman Eric Schmidt have backed a private race to the moon through the $30 million Google Lunar X Prize. Twenty-three teams around the world are competing to land a rover on the moon and travel 500 meters by the end of 2015 to win the competition. Page and Schmidt are backing a new venture, Planetary Resources, that aims to mine asteroids for profit. They are joined in that effort by H. Ross Perot, Jr., whose more famous father once ran for President. Brin has put a $5 million down payment on a future space flight with Space Adventures, the company that has seven seven tourists to ISS. No flight has been scheduled yet. Doug, do you know how much of their own money each has invested in space? More specifically, has Branson ever invested substantial amounts of his personal money directly into space related ventures, given that the original VG ‘investment’ came from Virgin company funds? Leaves a lot of space, so to speak, to get investors to support other privately developed space ventures such as SpaceX. I’m thinking primarily of European investors. SpaceX spent about $300 million developing the Falcon 9. One half-size say at 5,000 kg capability could be developed at perhaps $150 million. This amount would be sufficient to give Europe an independent manned space flight capability. And if you develop a Euro Falcon5, common sense says to then develop a “heavy” triple-core version. On the other hand it could be cheaper if they used the already developed Vulcain 2 engine. The engine development costs are a major part of the development cost of a new rocket. Eliminating that could reduce the development costs majorly. I think trying to re-use legacy hardware is chasing after a false economy. The lesson I take from SpaceX is that clean sheet designs using modern engineering/design/fab techniques can be much more efficient even than programs that re-use legacy parts. If you have to re-use someone else’s specialized space-flight hardware to find efficiency, then you’re probably doing it wrong. It sounds good in a government program management meeting, or when you’re briefing Congress, that re-use of old hardware will be more cost-effective (in fact, there’s probably “data” from some model to show just that), but it almost never pans. The industrial base and the state-of-the-practice will have moved on considerably in the decades since that hardware was designed (for a different mission, on a different vehicle, with a different customer, etc.). I’ll grant that it’s tough to draw many firm conclusions, because there’s so many correlated factors in the system development examples we do have. The lesson I take from SpaceX is that clean sheet designs using modern engineering/design/fab techniques can be much more efficient even than programs that re-use legacy parts. That said, there is also a danger in going for a clean-sheet design and trying to one-up the legacy hardware. If you are starting from scratch, you have to respect the fact that you are starting from scratch; that might mean developing a smaller/simpler version of the proposed design in order to train your dev team. Once they know it inside-out, then and only then design the next version, and the next. NASA seems to do make both mistakes. Either trying to reuse someone else’s parts, or dumping everything for a new design but going straight to the super-mega-version end design. It doesn’t save time or money to overreach. Hence my comment about F9 perhaps being a step too far for SpaceX. Getting it right before they fly the triple-core FH may cost them more than had they developed F5, proved the design, then developed F9. For SpaceX I think that was Falcon 1. You’re right: Falcon 9 is an expensive way to learn. Good thing they can get mission success with an engine out; hope they don’t loose two. Remember that Nasa inherited the Atlas and Titan from the ICBM program, and Von Braun’s germans which developed Saturn are long gone….. and even the boondoggle Shuttle designers are retired. No one now working at Nasa has EVER designed a successful rocket… or managed or flown a deep space mission. And Nasa’s miserably failed/cancelled Constellation project proves that Nasa is incompetent/incapable of designing a new rocket..
SLS/Orion is $60 billion more shameless Nasa earmarked pork for legacy shuttle suppliers.. unnecessary, unsustainable, unaffordable even if it ever flies..
We should leverage the proven SpaceX boosters/capsules for manned missions to Mars, lunar colonies, asteriods, etc.